Liberty & Co, a copper mirror inlaid with stylised Glasgow roses using a Mosaic of mother-of-pearl. A walnut swivel dressing table with shaped jewelery drawers within conforming shaped base on turned legs, in the style of Charles Spooner. Height 31.75" , Width 23" , Depth 7.5". Arthur Simpson attributed. An Arts & Crafts mirror with shaped top, the central bevelled mirror, flanked by stylised carved floral details. Height 28" , Width 46". 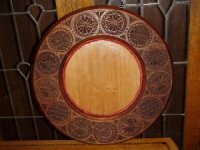 A Glasgow School Arts and Crafts mirror in the style of the Glasgow Four. 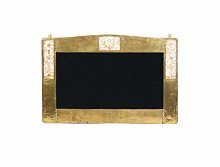 Mirror frame; Height 33 1/2", width 22". Mirror; height 27 1/2", width 16 1/2". 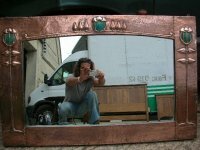 An Arts and Crafts heavy gage copper wall mirror with Art Nouveau female faces to each corner. Height 17 1/2", width 17". John Pearson, attributed. An exception copper mirror with lovely chocolate patina. Mirror frame; height 33", width 24". Mirror; 17 1/4" square. 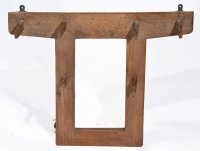 A Cotswold School Arts and Crafts hall mirror with coat hooks. Attributed to Stanley Webb Davis. An Arts and Crafts unpolished circular copper bevelled mirror in the form of a flower bud with good chocolate patina. Height 2 1/2", Width 13 1/4". An Arts and Crafts polished circular copper bevelled mirror in the form of a flower bud. Height2 1/2", Width 13 1/4". 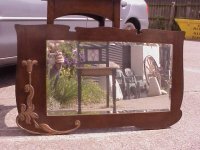 A good quality Arts and Crafts oak mirror with stylised floral copper details and a good shape with crescent style cut-outs to the top. Height 21 1/2", Width 36". Circa 1900. An Arts and Crafts pewter mirror with decorative heart and abstract line details. Height 15 3/4", Length 17 1/2". Circa 1900. 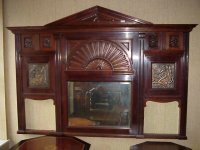 A good Arts and Crafts Mahogany overmantle with stylised applied copper butterflies, upper shelf and stylised floral cut outs to the top and sides. Height 47", Width 32", Depth 6". Circa 1900. 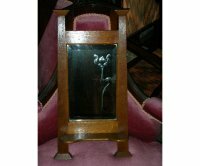 A small Arts and Crafts wall mirror in the manner of CFA Voysey, with bevelled stylised flower to the glass and small lower shelf. Height 22", Width at base 12 1/2". Circa 1905. An enormous Gothic Revival mirror with planter, the planter is not shown but fit's to the base and is full width and probably about 10" deep and 12" high perfectly made for indoor plants, it has identical designs incised around the planter and has canted corners to the front and stands on short turned legs and I think it still has it's original tin liner. I do have all the turnings for the top. 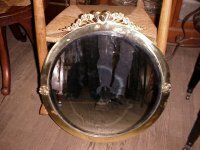 This mirror will need re-gilding which I can organise to your taste and it will certainly look stunning once restored. An overmantle of superior quality in the manner of George Jack with exceptional carved detais and wonderful hand formed copper panels by James Smithie depicting scantily dressed Maidens signed JS '96. James Smithie were important metalworkers from the Arts and Crafts period and there work was exhibited widely and shown in The Studio many times. Height 49" 123cm, Width 66 1/2" 178cm, Depth 6" 15cm. Circa 1896. A Glasgow School copper mirror with fantastic stylised Glasgow Roses to each side and a wonderful multi-coloured Enamel to the top. It is in original condition with it's original back. Height 22 1/2", Length 30". Circa 1900. 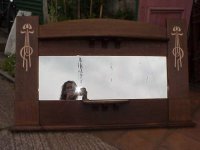 An Arts and Crafts copper plated mirror with hand formed copper Celtic details. Height 18 1/2", Width 31 1/2". Circa 1900. 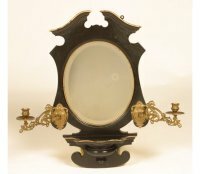 Aesthetic Movement Ebonised and Gilt mirror with sconces. Height 26 1/2", Width 16", Length of candle sconce 9". Circa 1875. 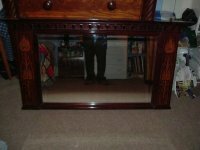 An Arts and Crafts oak hall mirror with stylised brass coat hooks. Height 24", Width 24". Circa 1900. An oblong Arts and crafts brass mirror attributed to Margaret Gilmour School with Celtic interlacing typical to her hand. Height 22", Width 14". Circa 1900. A good quality polished brass Arts and crafts round bevelled mirror with stylised floral decoration to each side of a heart and stylised roses to each side. Height 22", Width 20". Circa 1910. An oak Arts and Crafts inlaid over mantle. Height 3', Length 52". Circa 1900. A Rowley Gallery 'Peter Pan' mirror retaining the original label to the back, designed by Walter Crane. Height 19 1/2" Width 7". Circa 1900. 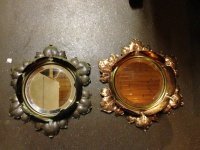 A walnut circular mirror frame with hand carved moorish circles all the way round the border probably made by Liberty and Co.
A Copper patinated brass bevelled mirror bordered with hand repouse fruit and floral decoration and a pair of candle sconces that swivel. Length 22 1/2" Width 21 1/2". Circa 1900. 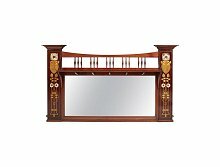 An exhibition quality Arts & Crafts Mahogany Mirror by Shapland & Petter of generous proportions measuring almost 5' wide and almost 3' high with Mother Of Pearl and Fruitwood stylized Glasgow Rose and Floral Inlaid details to each side. 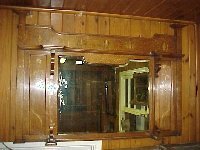 The upper section with the typical in house style S&P shaped spindles with a long shelf in front just above the original bevelled plate glass. 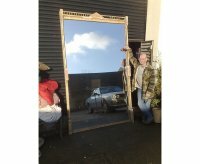 This is the biggest mirror by Shapland and Petter I have ever seen in 31 years specializing in the Arts and Crafts Movement. A beautiful work of art. Height 33”, Width 57”, Depth 3”. A rare Liberty and Co Arts and Crafts Pewter mirror inset with four Turquoise heart shaped Ruskin Jewels. Height 24, Width 33". Circa 1900. A good Arts and Crafts copper mirror with motto 'EAST WEST HAME'S BEST' with a natural build up of rich chocolate coloured patina to the copper. Height 21 1/2", Width 18 1/2". Circa 1900. 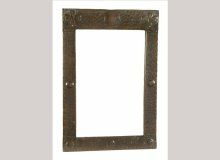 A Glasgow Style Arts and Crafts copper mirror attributed to Liberty Co in wonderful original condition with a good natural build up of rich chocolate coloured patina to the copper. Approx Height 22", Approx Width at base 14". Circa 1900. 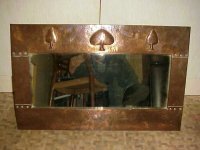 A Liberty and Co Arts and Crafts copper mirror. A copper mirror attributed to Liberty and Co with hand formed stylised floral details. A stunning piece in mint original condition. Height 18 1/2", Width 15". Circa 1900. A rare Arts and Crafts mirror or overmantle by Shapland and Petter with beautiful Peacock inlays to each side. Height 28", Width 36", Depth 3". Circa 1900. 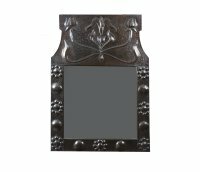 A stunning Arts and Crafts copper mirror with stylised floral details throughout set into an oak frame. Height 38", Width 38 3/4". Circa 1900. A fabulous Arts and Crafts copper mirror with stylised Peacock and motto which reads :- 'WELCOME EVER SMILES FAREWELL GOES OUR SIGHING' In the manner of The Guild of Handicraft. A Liberty and Co hand hammered and riveted Pewter mirror with subtle tapering form, little ears to the top corners and a beautiful Abalone butterfly to the upper centre. Height 27", Width 17 1/2". Circa 1900. 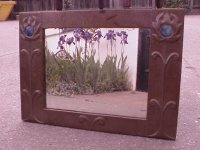 A superb Arts and Crafts copper mirror with beautiful blue Ruskin roundels and wonderful stylised floral hand repousse details. Attributed to John Pearson, it is heavy gage copper and deep precise work. Height 18", Width 25 1/2". Circa 1895. 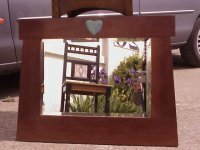 An Arts and Crafts Mahogany style mirror with subtle angular form with a light blue Ruskin Heart to the top. Height 22 1/2", Width 28". 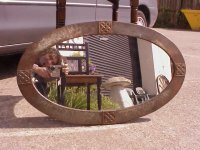 An Arts and Crafts Pewter wall mirror by Liberty and Co with 4 stylised repousse disks and original label to the back. Height 25", Width 20 1/2". Circa 1905. 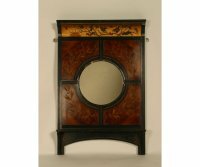 Aesthetic Movement Ebonised and Burr walnut mirror with incised stylised floral decoration and a hand painted scene of the Sun and birds on a berry bush. Height 32", Width 21", Depth 13". Circa 1875. 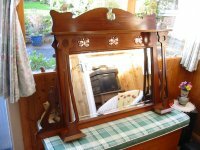 A large Arts and crafts oak overmantle/mirror attributed to Liberty and Co with wonderful stylised copper inlay to each side with curved upper shelf and small lower shelf, the mirror has gone a little in the middle. Height 30", Length 50 1/2". Circa 1900. An Arts and Crafts copper mirror with stylised tree of life within a circle, the tree of life is flanked by blue Ruskin jewels behind a copper clasp. Height 26 1/4", Width 20". Circa 1900. A rare Arts and Crafts brass oval mirror by Liberty and Co with heart shaped Ruskins to each corner. Height 33 1/2", Length 23 1/2". Circa 1900. 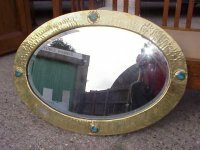 A large Arts and crafts brass mirror by Liberty and Co with Ruskin roundels. Height 28", Width 21". Circa 1900. A Glasgow School mirror with stylised floral repousse copper work in the style of Talwin Morris. Measurements 3' 6" Length and Height 27". Circa 1895. 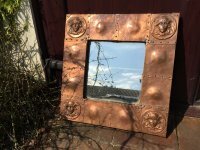 A Liberty and Co copper mirror with hand formed stylised floral repousse work. Height 25", Width 16". Circa 1900. A vanity mirror with an enamelled stylised Peacock to the back and an enamelled letter amongst green heart shaped leaves. Length 12 3/4", Width 6 3/4". Circa 1895. A copper mirror by Liberty and Co with hand formed stylised tree designs after a design by C F A Voysey. With original paper label to the back. Height 19", Length 28". Circa 1900. An Arts and Crafts copper mirror attributed to John Pearson with typical hand repousse stylised floral details. Height 18", Width 13 1/2". Circa 1900. 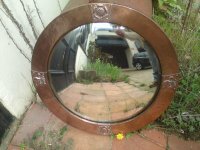 A large Arts and crafts copper mirror with six large Ruskin roundel's. Height 19", Width 16". Circa 1900. A brass mirror by Liberty and Co with four Ruskin ceramic discs rivetted into place. Height 21", Length 25". Circa 1900. 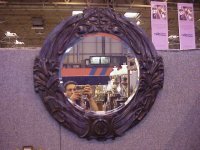 A large Arts and crafts oak mirror with floral carving of superior craftsmanship. Height 29", Length 28 1/2". Circa 1903. 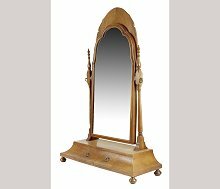 A large German Secessionist decorative dressing table mirror. Height 16", Width 12". Circa 1900. 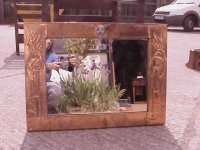 An Arts and Crafts copper mirror in very good original condition with a nice warm mellow patina. Height 22" Length 4'. Circa 1900. 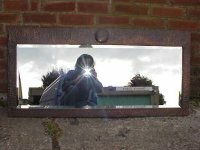 A mirror, 'The Meeting' designed by Chase.AND made by The Rowley Gallery. Church Street, Kensington, London. Height 10", Length 31". Circa 1900. 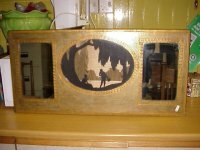 An Arts and Crafts mirror by Liberty and Co. Height 13 3/4", Width 8 3/4", Depth 3 1/2". Circa 1900. Liberty and Co. An Arts and Crafts copper mirror with a little blue Ruskin jewel to the top. Height 16", Width 11". Circa 1900. 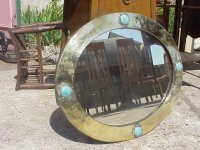 An Arts and Crafts copper mirror with blue enamel roundel by Liberty and Co. Height 27" , Width 15 1/2". Circa 1900.